Most people who tour Canada don't put the province of Saskatchewan anywhere on their list of "things I want to see". Even Canadians! I think that's because people envision flat prairie land and they think that all you'll see is fields of crops growing. Don't get me wrong...you will definitely see fields of crops growing! But there are pockets of beauty in Saskatchewan, such as our very own Cabri Regional Park. The vast majority of out of province people see Saskatchewan from the window of their car as they drive straight across the Trans Canada Highway. Not the most scenic part of Saskatchewan. Unfortunately, the Trans Canada Highway crosses Saskatchewan at probable the least scenic part of the province. So most people who drive through get to see the worst that the province has to offer. You really do have to get off the main highway to see what there is to see. Regina is the provincial capital. It's only 210,000 people, and there are only 1.2 million people living in the entire province! The largest city is Saskatoon, with a population of 260,000. 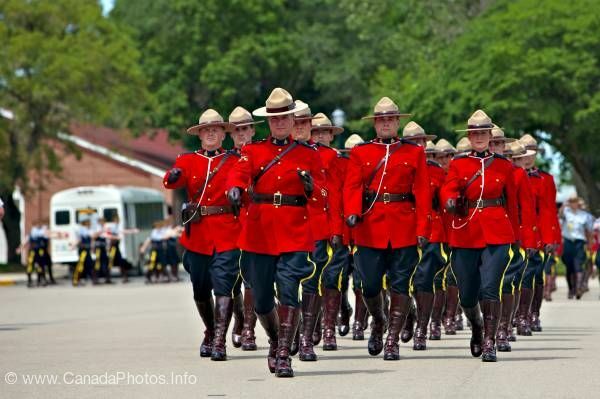 Regina is where Canada's world famous Royal Canadian Mounted Police (RCMP) are trained. New recruits have been sent here since 1885 to learn how to be a "Mountie". They have an RCMP Heritage Centre there where you can watch the Sgt. Major's Parade as the drill staff puts the new cadets through their paces. If I had a choice though, I would probably visit Saskatoon over Regina. We spent a couple of days in Saskatoon a few years ago, and it's a nice city to wander around. Our park is part of the Saskatchewan Regional Park system. There are 76 parks scattered about the province, and that doesn't include the Provincial Parks. All of the Regional Parks offer camping, but some also have golf courses, some have swimming pools, some have great fishing, and some have great recreational boating. Cabri Regional Park. Great camping and recreational boating. If you're a fisherman, you probably want to visit Saskatchewan. 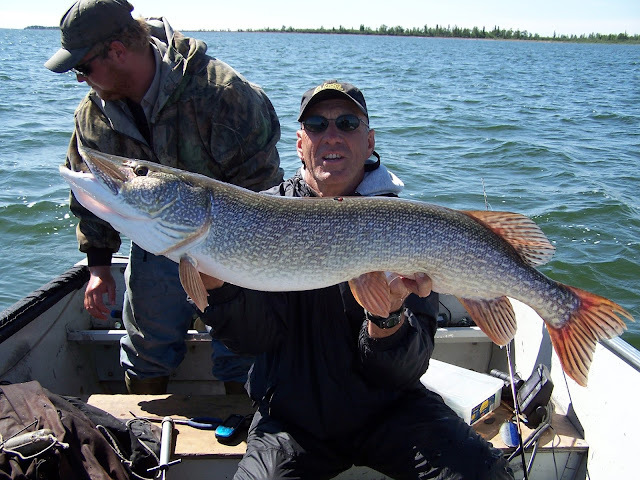 They pull some of the largest northern pike out of the lakes in the northern part of the province, in fact every year someone seems to get something around 40 lbs, and 10 to 20 lb fish are a regular event. Saskatchewan also has two National Parks...Grasslands National Park, and Prince Albert National Park. But again, you'll have to get off the main highway to get to either one of these places. So hopefully next time you're visiting Canada, you'll keep Saskatchewan in mind. And of course you're welcome to stop in and see us here. Yes, we do welcome our readers to stop in and say hi...or even stay for a night or two! Here's a great idea for RV'er...make yourself a reminder tag and attach it to your steering wheel so that you don't forget to put your antenna down, or to bring your steps in, or to turn your fridge on...anything you like! I put a sock over gear shift as a reminder. That's a great idea Carl! Hopefully we can get to stop by there this early fall if things work out for us, again more plans written in jello. I am probably the most guilty of skipping Saskatchewan, even though I have family there. I have flown over and around it many times but never driven through it. You need to do a cross Canada trip in the motorhome! I would love to visit that area. I think the terrain is beautiful. Not sure if it will ever happen though. Hmmm...maybe will will have to try that! Came as far East (from Vancouver) as Prince Albert once upon a time, but that was about it. Big sky country, that's for sure. Have to say we love watching the sky here, their motto here is "Land of the Living Sky" as it is ever changing. That pic of Saskatoon reminds me of a similar one I took in Winnipeg. Maybe you will have to add this to your agenda for next summer. You will love the East Coast! It is beautiful and the people are so friendly. Well we hope that you do make it up to Saskatchewan, and if you are in our area, you know that you are more than welcome to stop by for a visit. If you have any questions about Saskatchewan and things to see or do, don't hesitate to contact us and we will try to answer them. looks like a beautiful park!! too bad we are working in the summer time! Sue and Doug, we have the same problem! There's also the Trans Canada Yellowhead highway number 16. It also crosses Saskatchewan, goes through Saskatoon and is a more direct route to Edmonton when your going across Canada. Of course you wouldn't get to see Calgary. There is so much to see. But again, you need to stay off the main highways in order to see some of the more beautiful places here in Saskatchewan. You are so totally right though, there is just too much to see everywhere and there is no way to see it all. Manitoba gets the same bum rap - and there's lots to see here, but again, you have to get off the main highway. We would rather look at farmland in the prairies then look a scrub in the desert but we would rather do it from a back road than from a major highway or Interstate.